Marshal Culpepper proves determination can succeed. Marshall Culpepper’s career began in his teen years, when he volunteered to work for a Nortel Networks, a telecom company that was headquartered in Richardson. That high school gig turned into a paying one and got Culpepper started in the field of software engineering. About three years ago, Culpepper cofounded Kubos, a startup that aspires to be the Microsoft of small satellites. It makes an open source software platform for small commercial satellites — called CubeSats — that collect images and information in space. The tiny satellites are about the size of a box of tissues or loaf of bread. The software platform is included in satellites made by three manufacturers. Satellite users can pay for additional features, like support services and software updates. Denton-based Kubos (pronounced cube-ohs) has grown to seven people and recently raised $1.65 million led by Silicon Valley-based Draper Associates to hire more engineers, roll out its cloud product, move into a new office and sign more manufacturer distribution deals. The first satellite with its software platform may launch in May. It raised $700,000 from angel investors last year. Culpepper, the startup’s CEO, recently spoke about the funds that Kubos raised and its plans to grow. His comments have been edited for brevity and clarity. One day, my wife bought me a telescope for my birthday. I had never really seen Saturn with my own eyes, and I did for the first time. And it kind of changed my life. I became obsessed with the notion of space and how could I be a part of that, how could I do more. I became an amateur astronomer and I really started getting into it. I started reading a lot of space magazines—those things you do when you’re really into a subject. One day, I found this article about a startup in San Francisco that was trying to put these things called Arduinos into space. Arduinos are these little hacker kits you can buy — it’s like a little $20 hacker kit — and any student or developer can put code on these things. The idea was to put that on a satellite and put it up into space. ...I was really captured by this idea because as a software engineer with a new obsession of space, I thought it was a real way that software engineers could get tangibly involved in the process of space and have a runway into that field. I called the CEO of the startup [NanoSatisfi, now called Spire], and after about a month of convincing him, he decided to hire me. I became their first employee. ...I hired five engineers and within about a year, we had three CubeSats launched from the International Space Station. After all of that, I realized that my passion for space had a lot to do with what I could bring into the space industry with my software background. Spire ended up doing a pivot into more of a traditional data play. Around that time, I realized I wanted to take a traditional software platform approach to the space industry, and that was the birth of Kubos. Why did you decide to take the approach of working with manufacturers rather than selling the software directly? 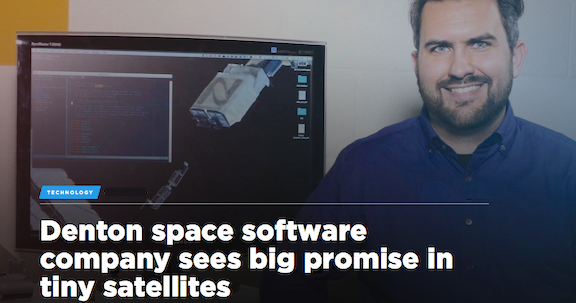 We spent a lot of time our first year working with satellite companies and satellite startups to try to get our platform on their missions, and it turned out to be a really long haul lead time process. We were getting into the companies either way, way too early, before they were ready for us, or way too late, when they had already made all of their crucial decisions. It turned out getting in with the manufacturers was the best route for a lot of reasons. The manufacturers get the RFQ [request for quotation] from the satellite companies when they’re ready to make a hardware purchase, which means we can be right there when they’re ready, the moment they’re ready. We don’t have to wait around until they have the funding or they make a decision. What about space captured your imagination and made you think it could be a business opportunity? I don’t think I thought about it in those terms when I first got the telescope. It was more like I was captured by how amazing just seeing a planet with your own eyes is. It’s hard to beat that experience. I thought ‘It would be amazing to go see that in person.’ And then one thing leads to another, ‘How do I go do that? How do I go up there? Well, I can’t. I’m too old to be an astronaut now. Since I can’t go to space, maybe I can send something I make to space?’ That was kind of the train of thought. You initially were doing Kubos on the side while still working. What finally gave you the courage to quit and work full time on the startup? It wasn’t a matter of courage for me. I’ve always been one who goes and takes risks. It was a matter of getting my idea into a good enough place to realize it was a company and not just a side project. I realized there was a viable model that I could actually turn into a business. Why did you decide to go to Silicon Valley to raise money? In our industry, space startups, all of the top tier investors are in Silicon Valley. Some of them are outside of the Valley, but the majority of them are there. I am probably one of the biggest supporters of the Dallas startup scene you’ll ever find, and really, really want to raise in Dallas and have always wanted to raise in Dallas. Early on, I had a dream that maybe I could only raise in Dallas. Unfortunately, it didn’t work out that way for my angel round [a $700,000 round raised in 2016]. And I found because I had so many good connections in the Valley, it was easier for me to network and find good opportunities there. Most people don’t know a ton about satellites. What’s surprised or fascinated you about them? I don’t think people realize how much data we’re going to have coming from space and how much it’s going to change our everyday lives. Everything from imagery to space weather.